One of our favorite summer traditions returned this week — Pianos in the Parks! Each day from July 8 through July 17 a special piano will appear at a local park, waiting to be played — for one day only. The result is a treasure map of quirky piano designs and unexpected musical encounters that sprawls across Seattle. Each day a different park receives its own piano, custom designed and decorated by a local artist to celebrate the space where it will reside for a day. In addition to the piano, each park has a scheduled concert from 12:00 – 12:30pm and a few parks have additional activities, ranging from a popup drawing studio to a build-your-own instrument demonstration. You can find out about special performances at each park here. 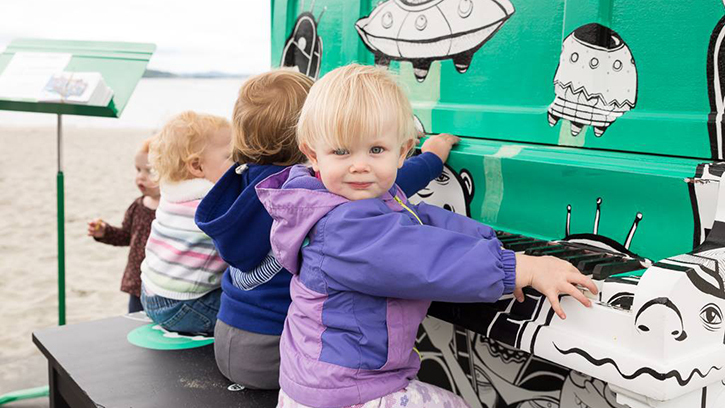 Pianos in the Parks was launched in 2014 as a public-private partnership that uses the power of art and music to get us out to discover parks, connect with people, and have fun. The program is supported by 17 partner organizations, including the Seattle Symphony. This year, we are hosting a an instrument making session on Wednesday, July 13, 2016 from 12:00–1:00pm at Westlake Park in downtown Seattle. We’re also excited to share that Seattle Symphony Board Member Nader Kabbani will give a short performance on Sunday, July 17, 2016 from 12:00–12:30pm at Alki Beach Park in West Seattle on the final day of the festival! You can find a complete map and schedule here, so get out there, play a tune and post your videos and photos with #PianosInTheParks for all to see and share! For more information about Pianos in the Parks, please visit pianosintheparks.com.